The open door of the emergency department is both a blessing and curse. As emergency physicians we pride ourselves on the ability to see, assess, diagnose and (initially at least) manage whatever the world can throw at us. Our daily census is a reflection of the society that we serve, and not simply the number of people out there, but a combination of the number, age, expectation and disease patterns that develop amongst our patients. Most importantly we get to see the patients in an unfiltered and typically uncontrolled fashion. Our workflows are not within our personal control with external forces producing significant shifts in our practice. When I was a medical student (which is some time ago as I qualified in 1992) I remember a public health lecturer telling us that by the time we qualified as consultants our jobs would be very different. A demographic time bomb awaited us that meant that the jobs were we were training for would be very, very different. This prediction seemed so distant at the time. Medicine and many clinicians often appear to suffer from illusions of stability and certainty. To some extent we live in the moment, deluded that we have already achieved our potential. This complacency can permeate hospital practice in the UK where planning takes the form of improving the current situation and services that we are in right now. Progress is aimed at quality improvement projects that improve short term metrics. 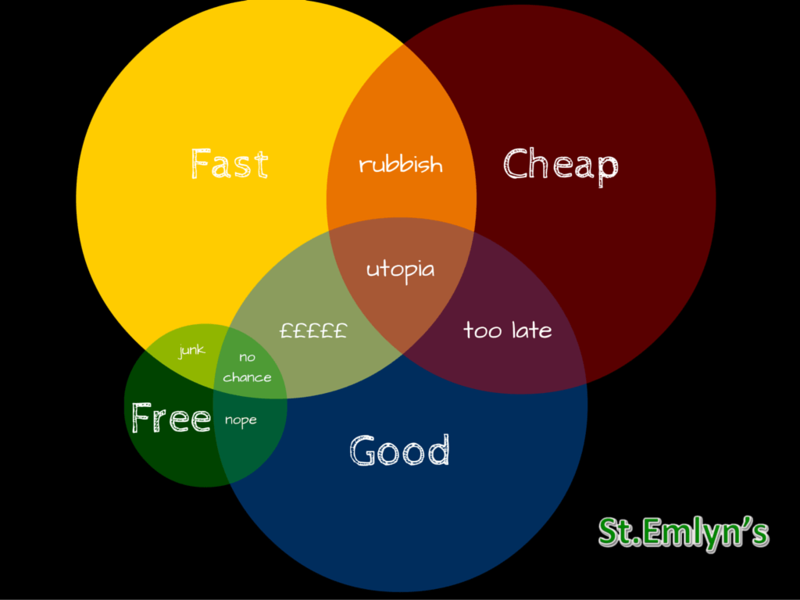 The question is: how can we do what we are doing now, but better, or faster, or more cheaply (or an illusion of all three). I do understand this. It’s easier to identify the problems of ‘now’, it’s easier to get help with the problems of ‘now’ and it’s easier to find out whether you’ve found a good solution to the problem of ‘now’. However, in the grand scheme of things the issues of now pale into insignificance when we consider the issues that lie just a few years ahead of us. Returning to age and the demographic time bomb. There is ample work on population growth that shows how populations change over time in terms of their age distributions. Developing societies have a rather pyramidal look to their age demographics whereas older populations (like their populations) become rather more rounded and may potentially invert. Whilst these changes take at least a couple of generations to take place, the impact can be felt within the time frame of a clinical career. Of course, the nature of these changes will vary depending on where you are in the world, and how far your country is moving along the demographic transition model. 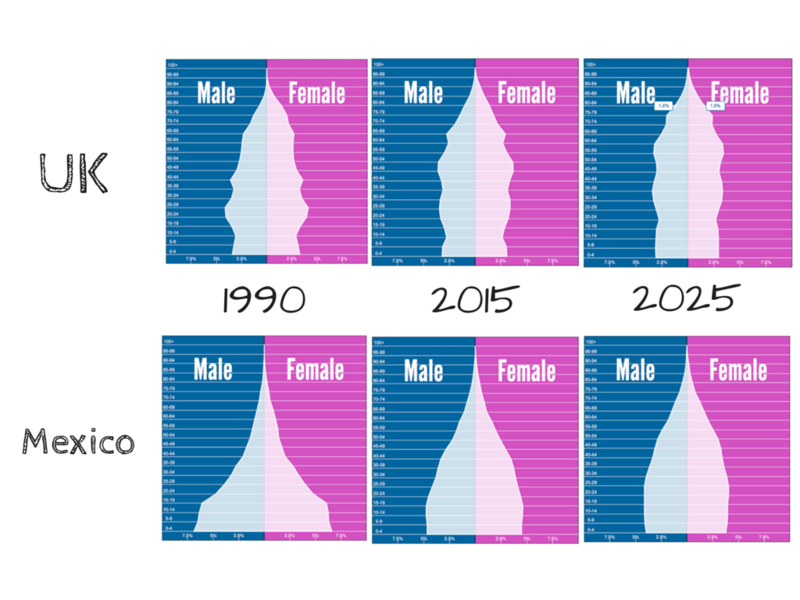 If we compare population distributions for Mexico and the UK from 1990 through to 2025 (roughly mirroring my career) then we can see changes in both, but with clearly much more dramatic changes for Mexico as it transitions the developing part of the model. For an ED doc newly qualified in Mexico back in 1990 then the experience as they approach retirement will be dramatically different. 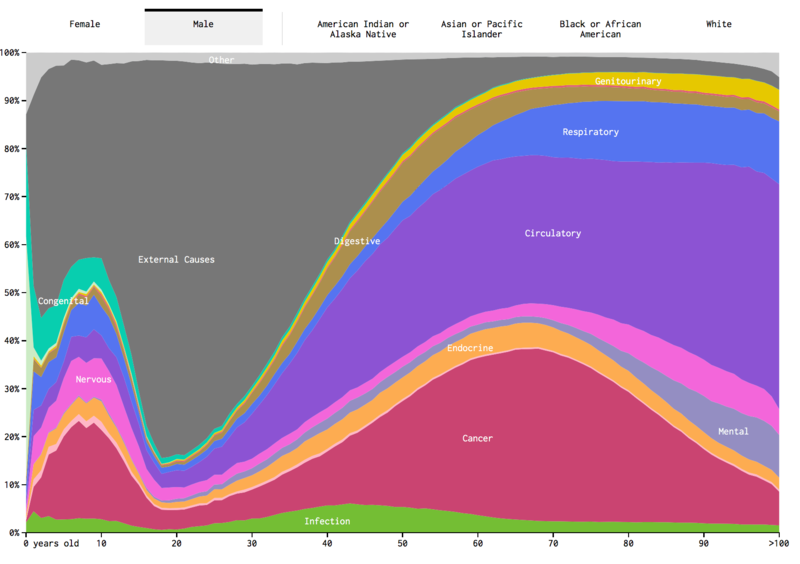 This demographic transition model has important consequences for emergency medicine. It’s pretty easy to see how this happens. Diseases of the young such as trauma and childhood sepsis predominate in expanding nations, whereas in the developed societies a greater proportion of elderly patients bring a pattern of complex, multifactorial and frailty associated disease. As an example, anyone who has ever worked in both a seaside town in the UK (with lots of retired people) and a South African hospital will fully appreciate the difference. If you need convincing then check out Robert Lloyd’s excellent blog on his experience in Cape Town. Similarly an increase in the proportion and number of elderly patients will bring the challenges of dementia care and social support. Issues beyond the direct focus of the emergency physician, but clearly ones that will greatly affect us. It’s worth pausing here and talking about terminologies, as it’s tempting to use terms such as grey tsunami, demographic timebomb, age crisis when we look at demographic data. Let’s just stop and pause to remember that we only have this perceived problem because of the success of social and medical care. We should be proud of being in this situation, it is arguably of our own making. Secondly, and this seemingly comes as a surprise to many people, we are all hoping to be one of them. Everyone reading this wants a fulfilling, safe and healthy lifespan, and although death is inevitable we really do want to be looked after and feel cared for as the years pass. In other words, I’m quite happy to take a selfish attitude towards demographics. It’s in our professional, personal and societal interests to plan for the inevitable (and especially the personal). Thus, it is the nature, nurture and narratives of the populations we serve that dictates our practice, and this will always be the case in a speciality such as EM which can rarely if ever control its flow. This inevitability is so obvious that it is rather surprising, in my opinion at least, that we rarely think about the future and thus risk failing to plan for our inevitable future lives. We can see this illustrated in figures below based on data from the CDC and beautifully illustrated by Nathan Yau at flowingdata.com who has very kindly agreed for us to link to his amazing graphics. You should run over to the website now if you can as it has a clickable datavisualisation which is fascinating to play with. 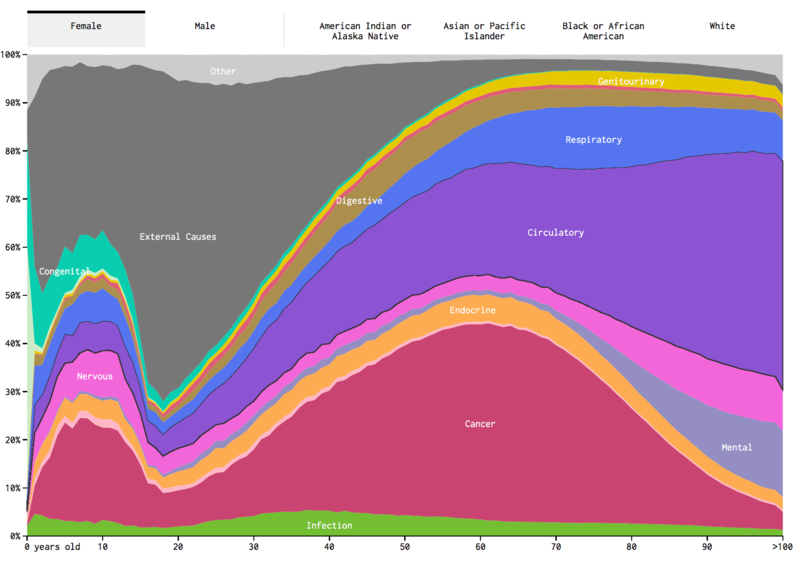 From that, and in the screenshots below we can look at all cause mortality as a percentage at all ages. 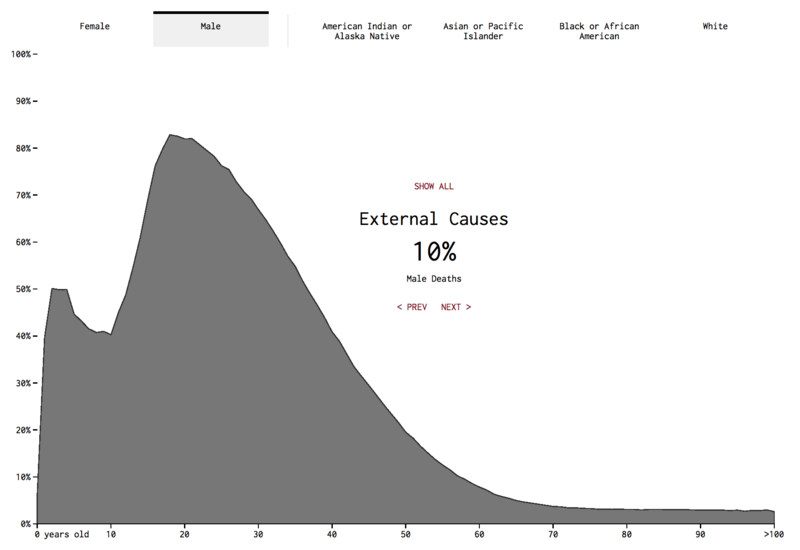 This clearly shows a huge peak in ‘external causes’, notably trauma in a younger age group. If we combine this data with the population distribution then it’s easy to see how the population demographic drives the EM experience. In addition some developing countries have higher violent crime rates and poorer health and safety laws. These also influence the type of patients we see in the ED. So, in our township hospital in South Africa trauma will be a major component of the ED experience, whereas in South Virchester and in the seaside towns of England the frail elderly, cancer and cardiovascular disease will dominate. Will the future workload be dominated by the elderly? For developed nations we are already experiencing an increase in age related illness and injury, and it’s going to get worse before it gets better as the baby boomer bulge advances into old age. The average age of patients attending the ED is increasing and according to the Royal College of Emergency Medicine the UK acquires an additional 250 people over the age of 85 every day. The biggest increases are in the oldest old patients, and in the ratio of patients of pensionable age to those of working age. In the UK this ratio is set to fall and then rise (largely as a result of changes to pension age) reaching a peak in 2039, i.e. within the working lifetime of most young and future emergency clinicians. This means that the proportion of working age people who will be in a position to care for the elderly will similarly rise and then fall over the next 25 years. It is sobering to consider who might then be there to care for people like me when I am older. Of course, all these changes to demographics, an increase in life expectancy, and a longer retirement (perhaps) is something that we should be celebrating; after all I want to grow old too. The flip side to a longer life expectancy is inevitably that this ageing population brings with it an increase in the need to clinical intervention and social care. It’s not just about the patients. As the proportion of elderly people in a population grows then so there is an increased demand for health and social care, which to some extent will be delivered by the younger generation. In societies with small proportions of elderly and large numbers of younger persons this is achievable. As population demographics move from a pyramidal to a more uniform age distribution problems will arise. The question of ‘who’ will be there to provide the workforce caring for the increased medical need of an ageing populace is unclear. Similarly the millenial generation has rather different attitudes to career and work to that which preceded them. The reasons and ranges for this are complex but the traditional model of full time, continuous working, hierarchical work within a health service may be less attractive than to precious generations. I’m always a little cautious about broad generalisations regarding the generation models, but there do appear to be patterns of behaviour that may challenge the traditional model of long term, hierarchy led healthcare careers. An increase in movement, both geographically and in terms of career, career breaks and flexibility are increasingly features of our younger workforce and wise employers will need to embrace rather than resist these characteristics. As an example from the UK, look at the amazing work done by Linda Dykes in North Wales. Her team developed posts that offered flexibility, interest and support, with tremendous success in recruitment and retention, a model for us all but one that lags behind many traditional learning programs. The nursing workforce in particular is changing. The media may suggest that nurses are young, but in many countries the workforce is ageing. The average age of a nurse in the UK is over 40 and the average age is rising year on year. Partly as a result of general demographic change but also as the student nursing entry age also rises. Whatever the reason it does mean that the working population is undergoing comparable changes to the patient mix. In the UK retirement age is now rising to 67 years for men, and may even be higher if life expectancy continues to increase. Our workforce will age alongside our patients. At the moment we, for various reasons, expect our younger workforce to take the brunt of unsocial hours and have even offered older doctors to come out of out-of-hours commitments altogether. Clearly, this is unsustainable and other solutions will need to be sought. What are we training for? Is it for the near and present problems that we face, or for the future. My impression is that predominantly and understandably the problems of today dominate our thoughts and processes. Emergency departments are stretched and when pressure is applied there is an inevitable focus on proximal threats. We’ve talked about the concepts of risk proximity on St.Emlyn’s before and in essence this means that we are more aware and worried about risks that are temporally close rather than those that exist in a possible future. At an individual level this is perhaps the right thing to do. The best emergency physicians have always been adaptable and dynamic learners. Medicine changes and the ability to change and adapt is clearly an essential part of being a good clinician. So for you today, and tomorrow, the key is in your personal adaptability. For educators and workforce planners it’s different. They should have a much longer time horizon to consider how the population and their needs are going to develop. The clinicians of the future will require the skills to manage the elderly, polypharmacy, multi-pathology patients. The other potential answers to the demographic change are considered in the post on politics. Emergency medical practice will be strongly shaped by the demographics of the populations we serve. Much of the changes in the age characteristics of our societies are predictable and thus we have the potential to plan for the inevitability of an older, less injured, sicker, more complex, social care influenced population. We must also remember that our staff are subject to similar influences and that our working population will mirror the changes of society. The implications for training the next generation of clinicians may be a move away from finite single system problems to an expansion in the understanding of complexity, ageing and the social care interface. Nursing the next generation. https://www2.rcn.org.uk/newsevents/congress/2012/submit_an_agenda_item/25_nursing_the_next_generation Royal College of Nursing. Nursing our Future. Royal College of Nursing. Characteristics of the Millenial Generation. 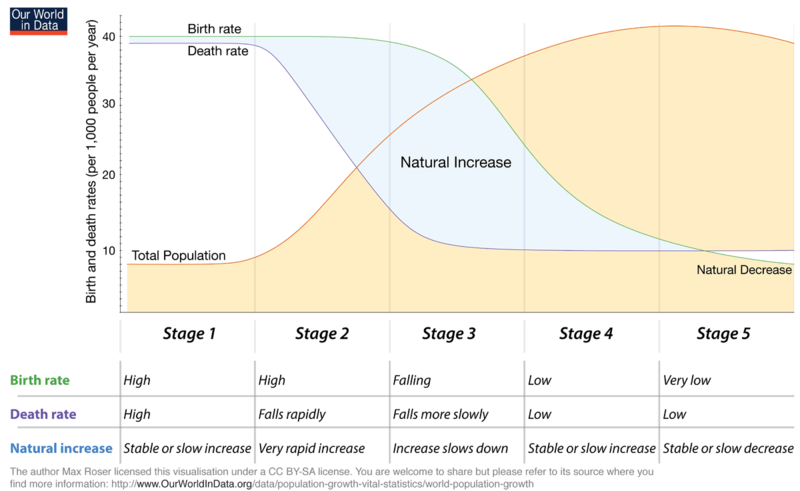 The demographic transition model. Drew Grover. Population Education website. The challenges of population ageing: accelerating demand for emergency ambulance services by older patients, 1995–2015. Judy A Lowthian, Damien J Jolley, Andrea J Curtis, Alexander Currell, Peter A Cameron, Johannes U Stoelwinder and John J McNeil. Med J Aust 2011; 194 (11): 574-578. National Population Projections: 2014-based Statistical Bulletin. Office of National Statistics. UK. 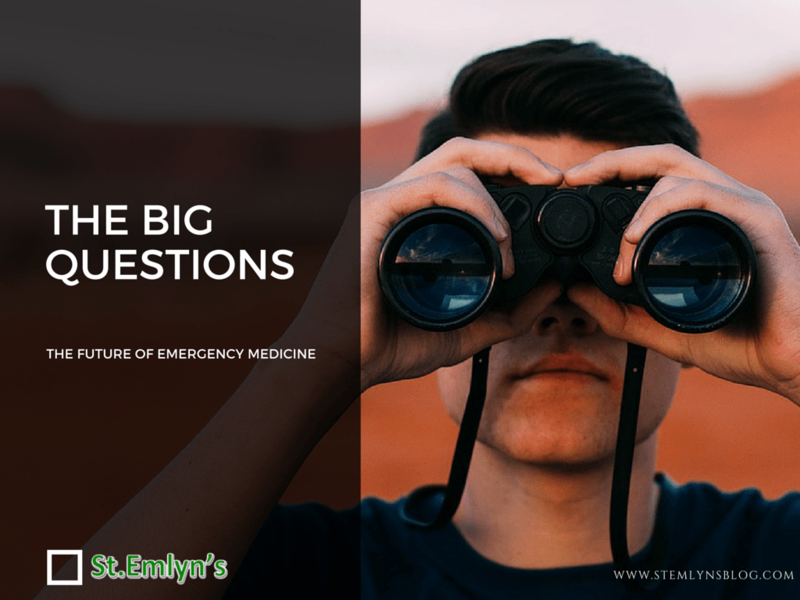 Does emergency medicine in the UK have a future? A M Leaman. Emerg Med J. 2007 Jan; 24(1): 5–6. Mountain Medicine: The unofficial website of Ysbyty Gwynedd emergency department.